Hiring and keeping good employees. It is an issue for lawn maintenance businesses. The green industry as a whole is struggling to hire and retain great employees. Each year that we conduct our Green Industry Benchmark Report, a comprehensive report on the state of lawn maintenance, landscaping and irrigation businesses, we see that this is a growing problem for hundreds of businesses that we speak with. So much so, that hiring quality employees is more of a concern than finding new work. There are a number of reasons that it has been happening. An uptick in the economy has enabled employers to pay more, creating more competition for people trying to find workers. Employees can be picky in where they want to work, they have the upper hand. But that doesn’t mean that great employees aren’t out there. 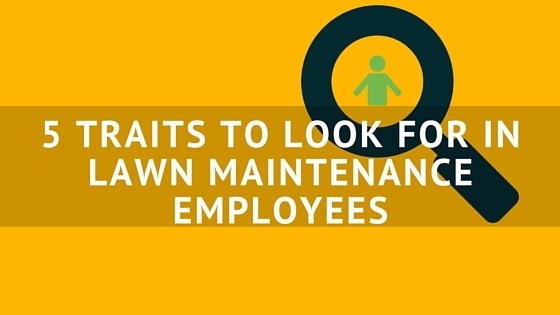 Here are five traits that you should look for when you’re conducting your interviews for your lawn maintenance business that can help you identify those awesome employees. One trait that is important to look for in lawn maintenance employees is enthusiasm. As you’re interviewing people for your open positions, you should be able to tell whether or not the person is enthusiastic right away. It is hard to fake enthusiasm. It is a trait that will help make your employees coachable and you know that they are willing to take on challenges. You want employees that can make decisions for the good of the business on their own. If you aren’t around or your crew leaders aren’t there for guidance, you want an employee that can make decisions on their own. While this might be a tougher trait to spot during an interview, ask questions that allow your job candidates to respond in a way that exhibits how well they can manage their time. What other roles have they held that allowed them to exhibit responsibility? If you’re hiring students, ask them what clubs, groups or teams they have been a part of. You want your lawn maintenance employees to be strong communicators. Communication is one of the most important soft skills that anyone can have. Being able to communicate effectively will enable your employees to deal with any customer issues, it will help them sell your services better and it will make working with them much easier. Curiosity is a desirable trait that you should look for in your lawn maintenance employees because it shows they are interested in the work they are doing. One question that we always ask when interviewing job candidates is “what are you currently obsessed with”? It throws people off, but often times it is something they are so interested in, they want to learn everything they can about that topic. You want people who are inquisitive and want to be able to improve their skills. This might be another trait that will be tough to tell whether or not a job candidate posses just by interviewing them. You want to make sure your lawn maintenance employees are going to do what they say they are going to do. If you’re able to, see if you can get a few references before hiring an employee. It might be tough to do if the person has limited work experience, however, you can ask if they are willing to put down personal references.